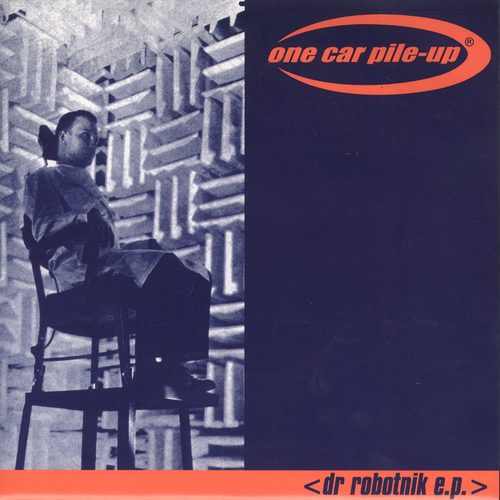 One Car Pile-Up - Dr Robotnik E.P. "Basically we got together in October 1996 after all being in other bands that had either split up, were winding down, or were forced to cease musical activites for legal reasons. Me & Chris were in Gan, Wes in Mental Seizure, and Towie in Terminus. Played our first show around Xmas '96 on a now-sunken barge in Grimsby docks and got lucky in the studio with what at the time was quite good production for a low-budget British punk band. about it. So, we vowed to record DIY from then on. Problem was, we had no recording equipment or any clue how to record anything even if we had. years worth of t-shirt money on recording equipment. Almost 3 years later, in Summer 2002, the album is done. We had to wait for computer processing technology to catch up with our needs, and we're also extremely slack & lazy, but it didn't stop us. We're still having as much fun doing the band as we did when we started, playing grimy venues in the arse-end of nowhere for £20, and loving every minute of it."